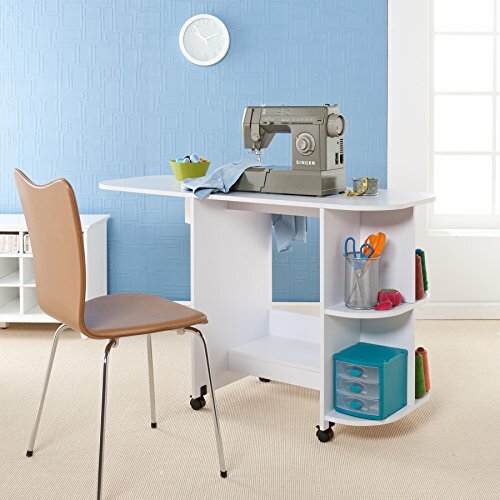 Home / Sewing / What Are The Best Sewing Tables To Choose Today? 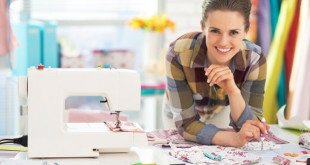 Even though you may not go entirely professional with your sewing, having the right tools and accessories for it can make the difference between the successful and not-that-successful projects. Sure, you may have had your fun times with the kitchen table, but a proper sewing table is going to help you take the more sophisticated and complicated sewing projects. 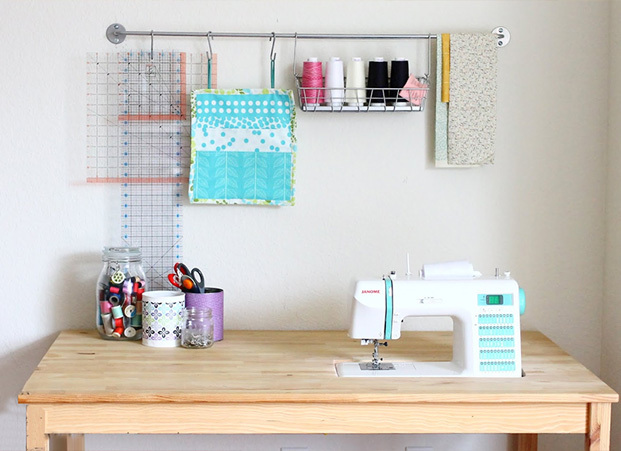 Having the right sewing table not only gives you more versatility in your projects, but also gives you this designated space that means your hobby is for real. Which are the features that count the most in a sewing table? 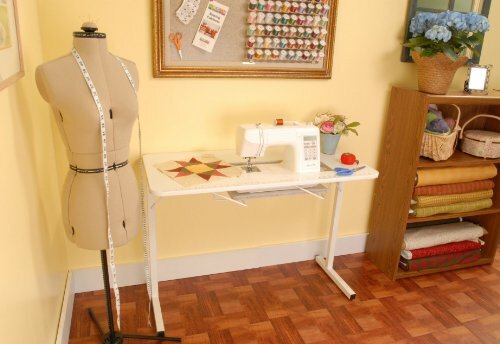 The right sewing table doesn’t just have to have to right size or to be heat resistant. Some other features are also important when choosing. You can’t go shopping without knowing the measurement as you don’t want to end up with a sewing table that is too big for your small designated space. The size and weight of your machine are also important. It’s not only the space that you’re going to place the table that counts, but also the size of your sewing machine that is important. Your sewing machine has to fit nicely on the sewing table, after all. As for the weight of the machine, this is more important only when you go for a sewing table with pneumatic lift. This is the first step to actually do with your sewing table is…to actually put it together. Sure, some sewing tables come already put together and are pretty much ready out of the box. On the other hand, there are also the sewing tables that are requiring carpeting skills and one full day for assembly. For everything in between, a sewing table that doesn’t surpass your ability levels is the ideal choice. Just to give you a time frame, you shouldn’t have to need more than 2 hours or so for putting together your sewing table. Additionally, you shouldn’t need more than one extra hand for assembly. Its stability sure counts a lot! As you’re going to move a lot or get into the more complicated sewing projects, you need a sewing table that is sturdy and stays in place, no matter what you’re doing. When you’re sewing at high speeds, there will be a lot of vibration and last thing you want is your sewing table to give up in the middle of your projects. A sturdy, well-made sewing table that has a durability feel to it, is always the way to go. How large is the surface area? The minimum you can have been that the sewing table is large enough to hold your sewing machine. Sure, this isn’t ideal as you want space also for pinning, ironing, basting and cutting. If you’re planning to get a sewing table that is large enough for that kind of operation too, it’s better to get one that has the right tabletop room. Nevertheless, some seamstress like to have all their current projects out where they can easily see them, in which case a larger surface area for the table becomes essential. Side note, if you’re also thinking about quilting, it’s a wiser idea to get a table that features a quilting arm so that everything becomes easier for your quilting projects. It’s perfectly fine if you’re into the clean, modern lines with plenty of empty space underneath. But, where are you going to store your half-finishes projects, the extra yard of nice fabric, the sewing patterns or the impressive thread collection? If you’re not planning to store all of them on your sewing table, a no-storage sewing table is a good choice. But this definitely means you got other crafting storage spaces plans. Does it have pneumatic lift? This is the last one to list as it’s not an essential feature on most sewing tables. It’s more of an extra-feature for the high-end sewing tables. It means you’re willing to pay the extra-buck for it. The pneumatic lift brings the sewing machine from its stowaway place in the cabinet right to the table top with only just push of a button. Fun and easy, right? Sewing tables are absolutely fantastic features and they are truly some of the most needed pieces of equipment for professional sewers worldwide. However, for most, they seem to dismiss sewing tables easily as they think they’re just a little too much trouble. The TDM sewing craft center folding table is really a lovely table and one which is going to offer so much. However, the TDM is truly a fantastic table and one that actually offers everything you will need and more. The oak wooden finish is actually appealing and it makes it look more than just a basic plastic table. The wheels to the bottom of the table is great and helps to make it a lot easier to move as well which is great for those who want to move the table from one location to another. The table comes with a host of additional storage space too and that is great. You have an underneath shelf to store the sewing machine once finished with if you want more room. The cabinet offers even more additional storage and it can become a real part of your home. It’s so very lovely and great for most homes too. Sewing tables come in a variety of formats and the Studio Designs 13362 eclipse hobby sewing center is truly a lovely addition. This sewing table does come with a nice and very simple design and there is plenty of storage to consider as well. You have three drawers to the side of the table and that helps to offer more storage space for threads and other items. The underneath shelf helps to keep the sewing machine sturdy in use; and the top shelf is great to store lots of additional sewing items too. 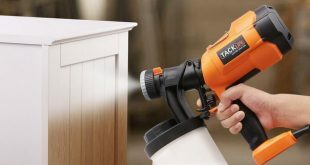 The adjustable tabletop feature is a great addition and this does offer so much quality too. In terms of costs you’re getting a fantastic table and its high quality too. The drop down platform offers more quality for sewers and it is quite versatile too. There are going to be more and more who will enjoy using the table and it’s quite easy to setup and use as well. The table is quite versatile and super affordable as well. 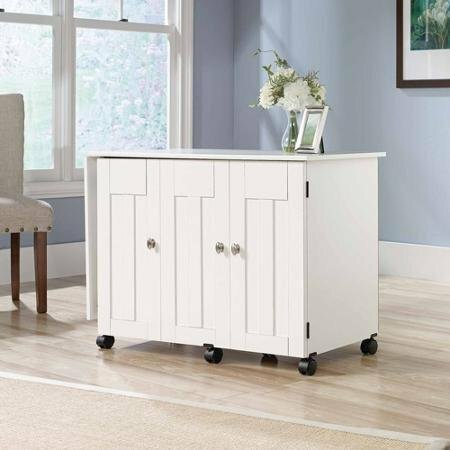 There are lots of amazing sewing tables to choose from including the Sauder Sewing craft cart and it’s truly a lovely option to consider. This table has a more authentic feel to it and one which can fit into any home perfectly. The cinnamon cherry finish is really quite appealing and it helps to look far more attractive as well. However, there is truly a lot of storage space available. You not only have the underneath storage shelf for the sewing machine but the additional side cabinet. 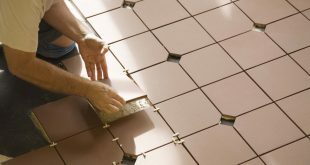 Once you have used up all these spaces, you can add to the other storage features. There are going to be lots of amazing storage solutions available here so it’s quite versatile. The wheels to the bottom of the table help to make this far easier to move. Portability is an important feature for most and this table is quite portable. Of course when you have the table fully decked out with all your sewing items, you may find it’s a lot heavier to move but not too difficult still. You will love this sewing table and it’s really very appealing. Choosing a sewing table can be a little tough for most but there is quite a few that standouts from the crowd. There are a few that actually offer a lot of quality and one which is great has to be the Studio Designs 13332.0 Comet table! This is going to be a lovely table and one you will enjoy using as well. However, when you first see this table, you might not be overly struck on it and yet it’s very nice. When you see the table you are going to find it fits perfectly into most homes and even if you don’t have a lot of space, this should be a great addition. 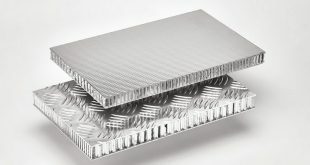 The solid steel frame is sturdy and very strong and the construction is at its best too. 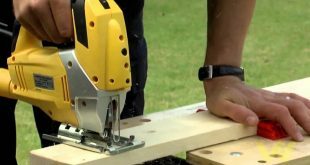 This table can house a sewing machine very easily and it’s easy to setup as well. Anyone who uses this will find it’s a perfect addition to their home and it’s one to enjoy time and time again. However, this does come with a lovely and affordable price so most will be happy with this. 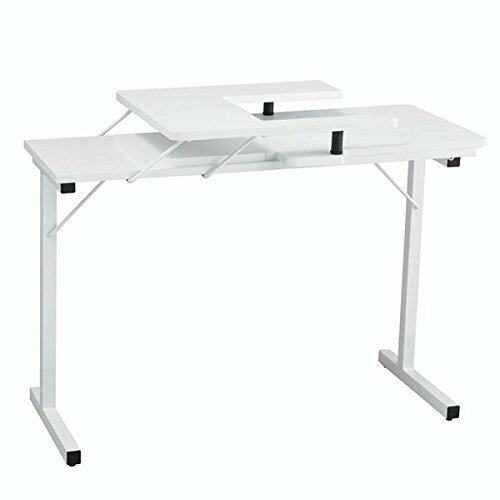 The soft white Sauder sewing and craft table is a great sewing table and one of the very best tables to consider today. If you want a more subtle approach with your sewing machine then this is the ideal choice. The table is very modern and very sleek indeed. It looks like a very average side table but that is the hidden charm of the table as it allows you to conveniently store the sewing machine with ease. The wheels are added to the bottom of the table and that will make it far more versatile. You can easily move the table from one location to another with ease and it should be a simple tool to use. Anyone who wants an affordable table will enjoy this one and there is a lot of quality on offer as well. However, it’s quite modern and that is what you are going to love most of all. The Sauder is able to offer a lot of storage space and that’s great as it means you can store all your sewing materials in one place. This will offer plenty of space for every little accessory and it’s a perfect addition to another home. It’s more compact and can fit into any home amazingly well. If you love to create your own quilts then you ideally want the very best sewing table for quilting. 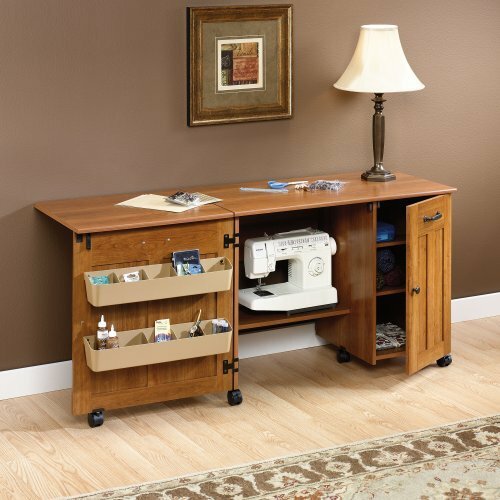 There are lots of amazing tables to choose from including the Arrow Sewing cabinets 601 GIDGET Sewing table. This table not only looks good but really stands out above the crowd. There isn’t anything here not to enjoy and you will love the table truly. In terms of looks, you might think it’s very basic but in all honesty, most sewing tables offer a very basic look to them. However, a basic look does not mean there isn’t any real quality because this Arrow Sewing does offer that and so much more. Anyone who loves quilting will enjoy the table and it’s easy to position so you can place a seat underneath and sit for hours here. However, when it comes to cost you’re getting a lovely price and an affordable one too. There are going to be many beginners and experts who will find this to be extremely versatile and highly useful as well. There isn’t anything to complain about here so you will love it so much! The Southern Enterprises has to be the very best sewing table for small spaces. Anyone who loves to sew and has a great sewing machine will need a great quality table and the Southern Enterprises Sewing table is a perfect addition. This table is a perfect option for those who are looking to save on space and it does have this lovely and very unique design. 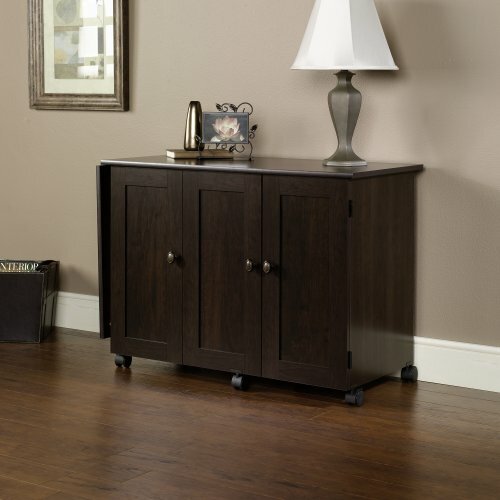 You aren’t just getting a table; you’re getting a lovely multi-purpose table with additional storage space. For instance, you have a folding shelf which can be used when you are sewing; when it isn’t in use, you can fold down. However, there is also an under unit shelf which can store the sewing machine and there are two further shelves as well. In terms of portability, the table is incredibly portable. You have the four roller feet attached to the bottom which makes this easy to move around. However, the go anywhere craft station is a great worktop as well as a lovely storage solution. You are going to love this and all it has to offer as well. The Horn of America 33 Sewing machine table in all white is quite a lovely sewing table. 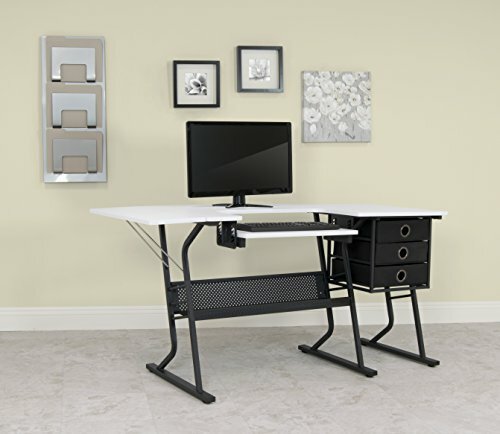 This has to be the very best sewing table for the money and while it does come with a small and affordable price, it’s high quality. There are going to be so many people who are just starting out with sewing and getting the right table is important. However, the table is a great tool and one that is going to be easy to use. However, the table is sturdy and extremely versatile too. It doesn’t matter if you have a lot of room to spare or very little, this is a great table. The sewing machine table can be quite versatile and easy to use up and use too. If you have a sewing machine then you can easily place this into your table and it’s quite affordable as well. 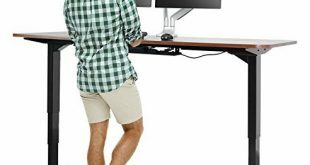 The table doesn’t in fact weigh a lot and that will make it far more portable. If you want to move from one location to another, it can be extremely easy and very simple to do as well. However, it isn’t overly big but not too small either; it’s just perfect so that’s good. You love to sew and want a great sewing table as it’s a necessary tool. However, when you have a budget to work with then things can be a little tougher but not impossible! 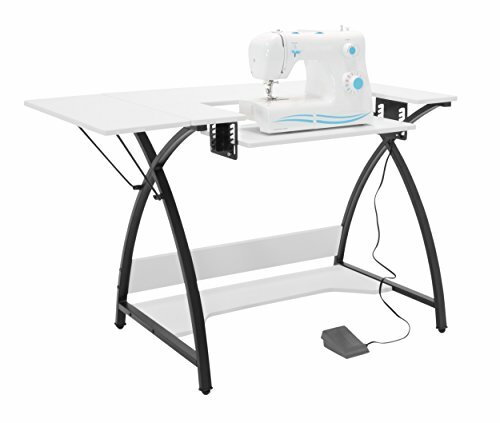 One of the very best cheap options to consider might be the Studio Designs Eclipse sewing and craft table! Now, this is truly a lovely table that everyone will adore. The sewing table does come with a very simple and unique design and that can be a great thing. You have a lovely design that offers an underneath storage solution which will be very important. You can store some additional threads or books underneath and the costs are very affordable too. However, the drop down platform is nice and very strong too so that will offer more space and more quality in so many ways. 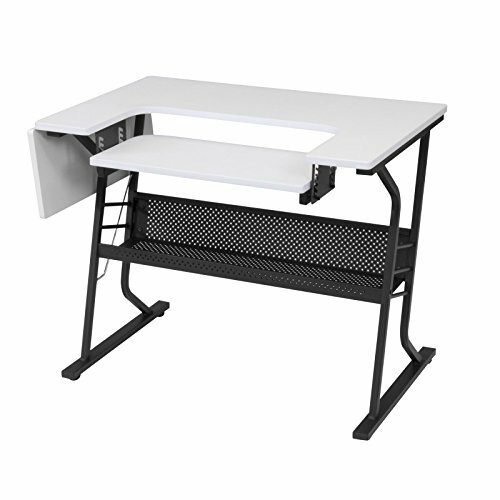 However, the folding side shelf is a great addition and the adjustable platform is great for those who want to adjust their sitting height. Sewing machines are sometimes large and very complex tools and if you don’t have the necessary accessories such as a sewing table it can actually be far difficult to use. However when you have the table that fits you and your equipment, you will find it a lot easier to carry out all your necessary sewing tasks. These tables are amazing and they will be a great addition to your home too. Previous What Is The Best Sewing Machine Under $200?